April 12: The Siouxland Salvation Army Corps continues working hard to provide flood-relief items and a full spectrum of additional support to area communities affected by the Flood of 2019. 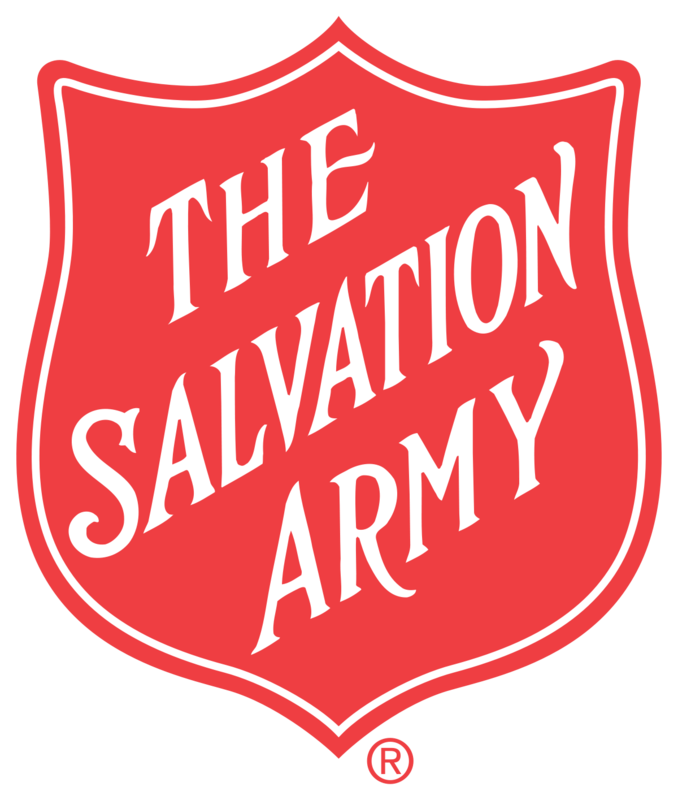 The Salvation Army is seeking donations to support flood-relief efforts. To donate: go to www.salarmyomaha.org and click on the ‘Donate Now’ button, or call 402-898-7675. April 5: The Salvation Army Western Division’s three-state flood-relief effort is moving into its fourth week. As it does so, there are some new developments to report in addition to updates on ongoing work. March 29: The Salvation Army Western Division is set to enter its third week of flood-relief work over the weekend. Service totals through midday Thursday, March 28 include: over 20,000 meals served; 23,200 drinks served; 18,300 snacks served; 11,600 other items delivered (including flood-cleanup kits); and 9,750 volunteer hours worked. In Council Bluffs, IA—The team there served lunch to people in Hamburg, Iowa, on Friday. They plan to serve meals on Saturday in Missouri Valley, Iowa. In Omaha, NE—The Kroc Center team served about 900 meals and over 1,250 drinks on Thursday between operations in Douglas and Sarpy Counties. Elsewhere, the Disaster Resource Center continued its operations near 84th and Center; it’s set to be open again Saturday from 9 a.m.-6 p.m. In Sioux City, IA—The team there assisted with meal service in nearby Hornick, Iowa. In Fremont, NE—Officers, staff, and volunteers served over 200 meals at lunchtime, and some 220 meals at dinner on Thursday. In Kearney, NE—The team there is set to provide social services support in the community of Dannebrog, Nebraska, this weekend. In Norfolk, NE—Officers, staff, and volunteers served meals on the Santee Reservation. In Watertown, SD—The Corps there delivered flood-cleanup kits—and is standing by to serve as an emergency shelter if needed. In Rapid City, SD—The team there is working with Pine Ridge Reservation residents, leaders, and volunteers to get food boxes to people who have been stranded by flood waters. This work is part of multi-agency flood-relief efforts at Pine Ridge. In Omaha, NE—The Kroc Center team served about 1,350 meals on Wednesday between operations in Sarpy and Douglas Counties. The team is set to begin supplying food to The Salvation Army’s ongoing feeding operations in Fremont on Friday. Meanwhile, the Disaster Resource Center continued its operations near 84th and Center; it’s open again Friday from 9 a.m.-6 p.m. In Council Bluffs, IA—Officers, staff, and volunteers served lunch to people in Hamburg, Iowa. In Sioux City, IA—The team there served meals in Hornick, Iowa. An additional Sioux City-based team worked in Ponca, Nebraska, on Friday, serving families via financial assistance and supplies. In Kearney, NE—The team there has been providing flood-relief assistance this week in Buffalo, Hall, and Watson counties in central Nebraska. In Fremont, NE—Officers, staff, and volunteers served about 150 meals at lunchtime. In Watertown, SD—The team there is set to receive a shipment of flood-cleanup kits; plans call for the kits to, upon arrival, be given out to those in need. The Watertown Corps has been asked by local officials to be ready to serve as a flood-relief shelter if needed—and is making specific preparations in response. In Council Bluffs, IA—Officers, staff, and volunteers sent a truck to Hamburg, Iowa, loaded with breakfast foods. Elsewhere Tuesday, the team did intake work in Shenandoah, Iowa. On Wednesday, plans call for the team to serve lunch in Hamburg; they plan to continue serving lunch there in the days to come. In Omaha, NE—The Kroc Center team served some 850 meals on Monday as it continued its work in Sarpy and Douglas Counties. Plus, the Disaster Resource Center continued its operations near 84th and Center; it’s open again Wednesday from 9 a.m.-6 p.m. In Watertown, SD—Officers, staff, and volunteers sent water and snacks to the community of Lake Poinsett, South Dakota, as the flood threat continues to unfold in the eastern part of the state. They also continued to provide refreshments to people working local flood-prevention efforts. In Sioux Falls, SD—The crew there worked on providing flood-cleanup kits to nearby communities. In Norfolk, NE—The Norfolk team again served meals on the Santee Reservation in Knox County, Nebraska on Tuesday. They also provided flood-relief support in Columbus, Nebraska. In Omaha, NE—The Kroc Center team served some 700 meals and 900 drinks on Saturday as it worked mainly around lakeside communities in Sarpy County. What’s more, Team Rubcion, a nongovernmental organization specializing in disaster response, has established a base at the Kroc Center as it goes to work in the metro area. Elsewhere, the Disaster Resource Center continued its operations near 84th and Center—both distributing flood-relief items and taking in donations thereof. It’s open again Monday from 9 a.m.-6 p.m. In Council Bluffs, IA—Representatives of the Council Bluffs Corps met with flood-affected residents in Fremont County, Iowa on Sunday. The Corps team plans to start food-service operations later this week in Hamburg, Iowa. In Sioux City, IA—Officers and volunteers served 110 meals at lunchtime amid their overall flood-relief efforts. They are set to travel to Ponca, Nebraska, tomorrow, to deliver supplies there. In Norfolk, NE—Officers, staff, and volunteers prepared meals at the Corps location. They have been providing meals to the Santee Reservation in Knox County, Nebraska. 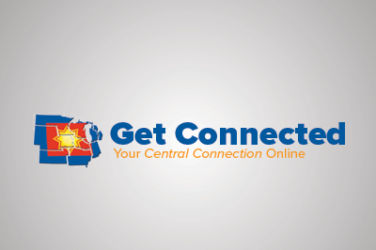 They are also, in partnership with officials, in the process of reaching out to Boyd County, Nebraska, and the community of Niobrara, Nebraska, as they look to provide supplies and other support there. In Watertown, SD—The team there provided refreshments to crews working flood-prevention operations along the Big Sioux River—whose water levels are expected to crest midweek. March 23: With more than ten canteens (mobile kitchens) on the move around flood-affected parts of eastern Nebraska and western Iowa, The Salvation Army Western Division pushed forward with its flood-relief efforts Saturday as the week came to a close. In Council Bluffs—The Council Bluffs Corps team was in action Saturday in Mills and Fremont Counties in southwest Iowa. Among their work there: doing intake at a food-and-supplies distribution center in Glenwood, Iowa. The team is now planning to spearhead three-meal-per-day food-service operations starting midweek next week in Hamburg, Iowa. It also plans to distribute flood clean-up kits there in the coming days. In Sioux City—The Sioux City team continues to provide refreshments in the nearby community of Hornick, Iowa, and is set to resume food service there on Monday. Officers and staff plan to head over to Ponca, Nebraska, next week to assist with flood-relief efforts there. In Omaha—Officers, staff, and volunteers from the Kroc Center continued food service today in several Sarpy County lakeside communities. Elsewhere, the Disaster Resource Center continued its operations near 84th and Center—both distributing flood-relief items and taking in donations thereof. It’s open again Sunday (12 p.m.-5 p.m.) and will continue operations next week. In Fremont—Officers, staff, and volunteers have been distributing flood clean-up kits, and continue to work in food-service functions in town, as well. 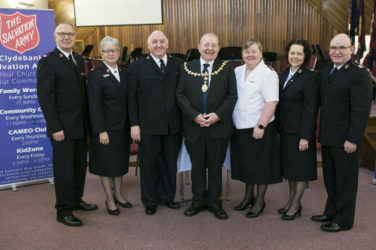 March 22: The Salvation Army Western Division is calling in additional officers from outside of its home base in Omaha to bolster its ranks as it continues with large-scale flood-relief efforts. March 21: After about a week’s worth of relief operations in Nebraska, South Dakota, and western Iowa, The Salvation Army Western Division is accelerating its efforts to reach people affected by the floods. In Omaha—The Kroc Center provided some 354 meals in support of Sarpy County shelters. The team there is set to bring bottled water to the Hawaiian Village community on Friday. Elsewhere: the operation at the old Canfield’s building opened with a new name Thursday—the Disaster Resource Center—as well as a new operational focus: that of being primarily a distribution center for flood-relief items. Its hours have also expanded: Mon-Sat 9 a.m.-6 p.m. and Sun 12 p.m.-5 p.m. In Sioux City—The team there served some 600 snacks and 300 drinks today as they worked to provide food, supplies, and emotional-spiritual care to flood-damaged areas near Sioux City. In Council Bluffs—Corps officers and staff are set to load their canteen truck with cleaning supplies, food, children’s toys, and other items and drive to Hamburg, Iowa on Friday to deliver them and provide additional support. They also plan to assist with flood-relief efforts in Bartlett, Iowa Friday. In Norfolk—Officers, staff, and volunteers delivered meals and clean-up kits to nearby Battle Creek. In Fremont—Officers, staff, and volunteers served lunch to more than 200 people; plus, they delivered bottled water to nearby communities. In Sioux Falls—The team served meals to a nonprofit search-and-rescue team working there. March 20:Canteens—also known as mobile feeding units—are on the move for The Salvation Army in flood-affected communities around eastern Nebraska and western Iowa. When disaster strikes, these specially equipped vehicles bring food, drinks, and other essentials to those in need. In Fremont—The team worked alongside a special nonprofit group to serve food to some 325 people via a canteen stationed in town. A second canteen served food in nearby Hooper, Nebraska. In Valley—Plans call for a truck with flood-relief supplies to arrive in town on Thursday, March 21. In Council Bluffs—The team there prepared for a deployment to Hamburg, Iowa, where they are set to help with flood-relief and -recovery efforts starting in the latter half of the week. In Omaha—The Kroc Center, as of midweek, had served nearly 300 meals via their kitchen and had also been providing emotional-spiritual care. Elsewhere: the flood-relief-items donation center at the old Canfield’s near 84th and Center continued to take in donations of flood-relief items. In Sioux City—Officers, staff, and volunteers served 100 breakfasts and 800 snacks in flood-affected communities near the Sioux City area; they also handed out toys to flood-affected families with young children and provided emotional-spiritual care to dozens of people. In Norfolk—The team there spent much of Wednesday helping people via distribution of clean-up kits, hygiene products, and mattresses. March 19: From bringing cleanup kits to towns isolated by floodwaters to serving hundreds of meals to large groups and providing emotional and spiritual care to disaster survivors, The Salvation Army is pushing forward in its efforts to help across eastern Nebraska and western Iowa. In Fremont, Neb.—The team ramped up its support of local food-service operations and expect to serve 400-500 people at each meal time. Officers, staff and volunteers are looking to provide meal service to smaller, neighboring communities in the days to come. In Omaha, Neb.—The Kroc Center is providing meals to a Bellevue flood-relief shelter. The flood-relief-items donation center at the old Canfield’s near 84th & Center is collecting items for distribution, including bleach, work gloves, rakes, mops, shovels, buckets, tarps and household cleaning items. In Sioux City, Iowa—Officers, staff, and volunteers are providing three meals a day along with food and supplies to flood-damaged areas around their base of operations. 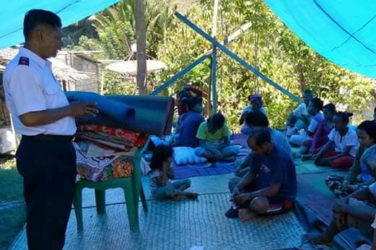 They have also provided flood kids and emotional and spiritual care to those in need. In Norfolk, Neb.—The team sent a truck stocked with bottled water and about 100 clean-up kits to the nearby community of Spencer. Officers have also provided emotional and spiritual care in the areas of Pierce and Osmond. Volunteers took bottled water to the town of Verdigre.